Hole number 1 is a 268 yard, par 4. Longer hitters will be tempted to "get there" in one. Be careful though, guarding this small green are trees and O.B. left and a bunker in front of the green. Also crossing the fairway is Creegan's Creek. A short or errant hit will leave you wet and searching for your ball. We recommend a 200+ yard shot to the right side of the fairway, which will leave an easy wedge shot to the elevated green. Hole number 10 approaches this hole from a different angle and plays 238 yards. Longer hitters will try to reach the green in one. Again, beware of the sand bunker guarding this small green. A 200+ yard shot to the right side of the fairway will leave you an easy wedge shot to the elevated green. Holes 2 and 11 provide the golfer with a challenging 185 yard par 3. 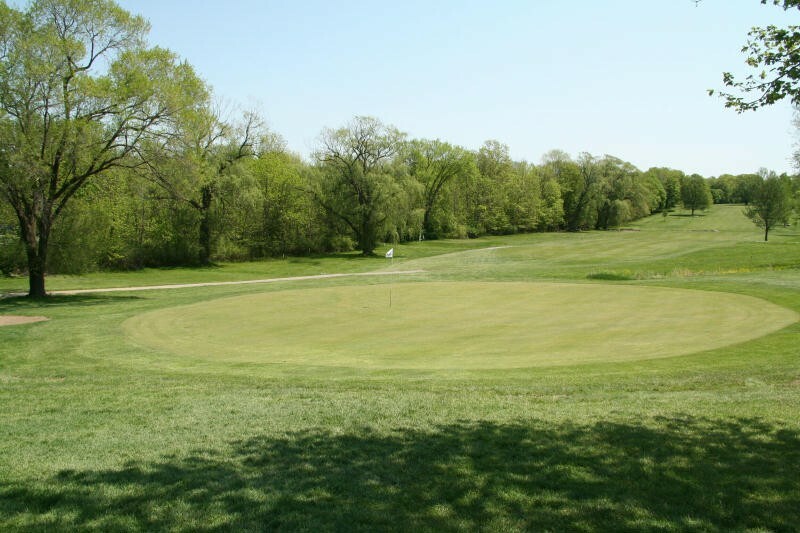 Beware the false front to this green...If your shot isn't firmly on the middle or back of this green you may find your shot rolling back towards you leaving a long, uphill, breaking putt. Holes 3 and 12 are 475 yard, par 5 holes. 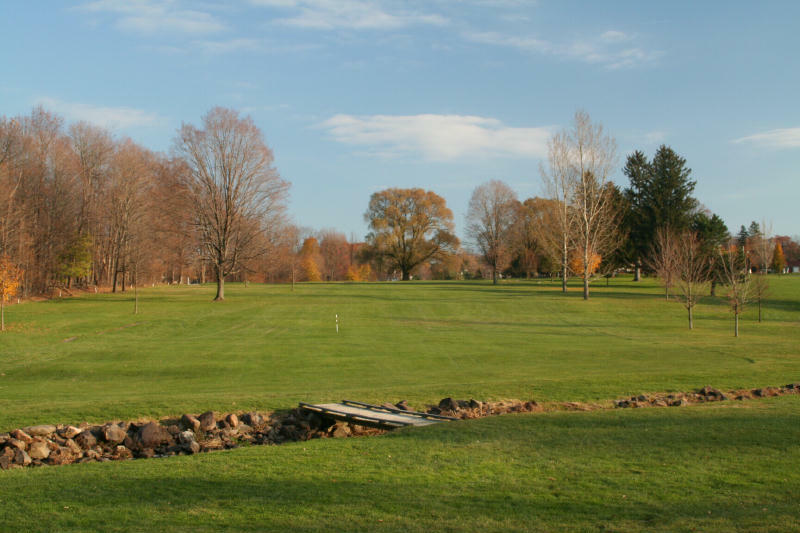 Your tee shot should land on the left side of this left to right sloping fairway. Your second shot (if you're not going for it in 2) should be a mid iron short of the hill to the elevated green. Your next shot should be a short iron or wedge aimed at the left side of the green. This green slopes severely left to right. Beware the hidden bunker left and short of the green. 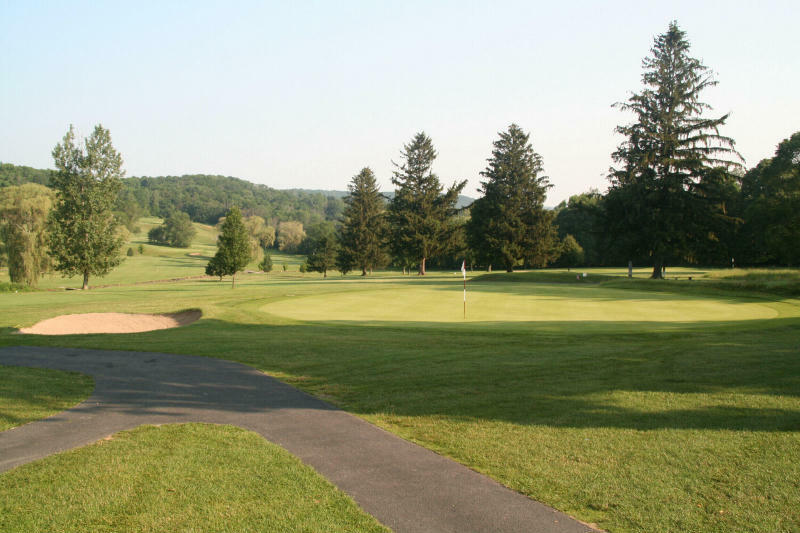 Hole number 4 is a 189 yard, par 3, providing the golfer with a downhill shot to a green sloped right to left. You must aim your shot to the right side of this green to have it stay on the green. Hole 13 plays 135 yards from a less elevated tee box. Again, keep your tee shot aimed at the right side of the green. Hole number 5 is a 463 yard par 5. 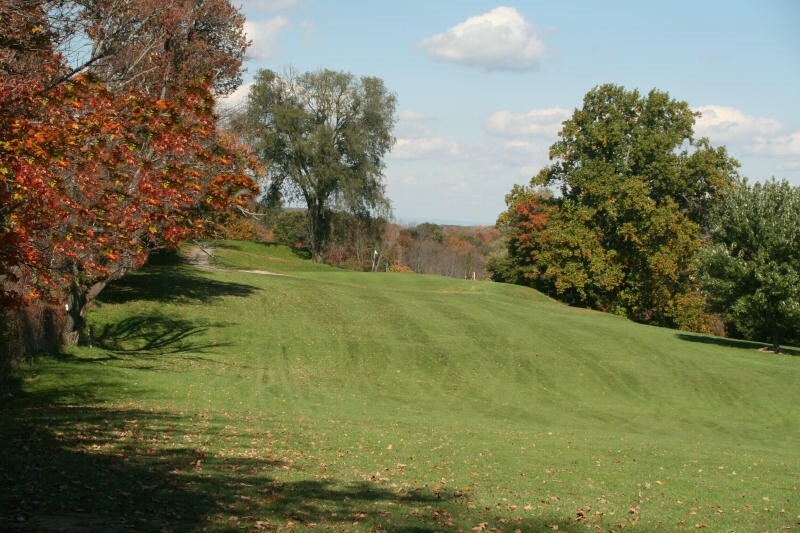 You must have a good drive in order to put you into position to make a second shot over Creegan's Creek. Your 3rd shot should be a mid iron onto a green that slopes right to left. Hole number 14 is a 400 yard par 4. 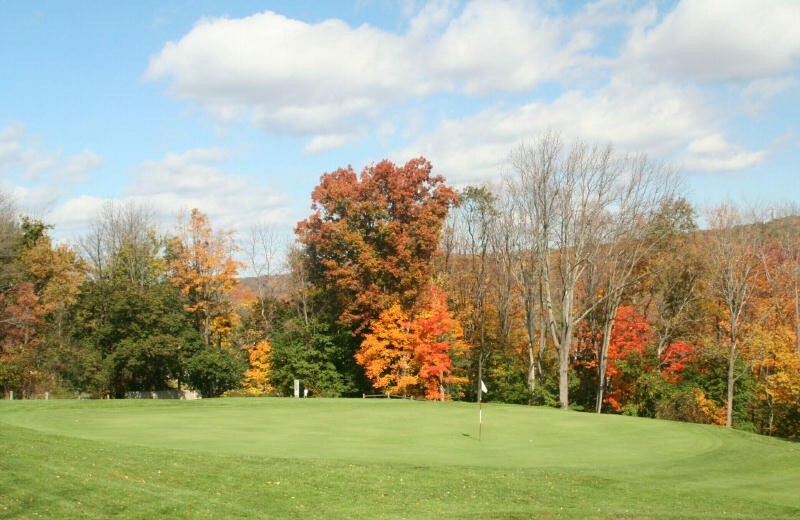 Your drive must carry 200+ yards to clear Creegan's Creek. The left side provides a shorter carry than does the right side. You will then have an uphill mid iron to the green. Hole 6 is a 125 yard, uphill, par 3 to a green protected with bunkers left and right. Hole 15 increases the distance to 175 yards. On hole 7, a 435 yard, par 4, your drive is critical. Longer hitters should have no problem getting over Creegan's Creek. Other hitters may want to lay up right and short of the creek. The left side offers a shorter carry over the creek. The green slopes left to right. Hole 16 is a 462 yard, par 5. You'll need a long drive to get over Creegan's Creek. A safe bet is a 200+ yard shot right and short of the water. Then a mid iron followed by a wedge to the green that slopes left to right. Holes 8 and 17 are 298 yard par 4's. Keep your drive right or you'll be in trouble left. Your second shot will require a high wedge shot that lands softly onto this small elevated green protected by bunkers front and left. 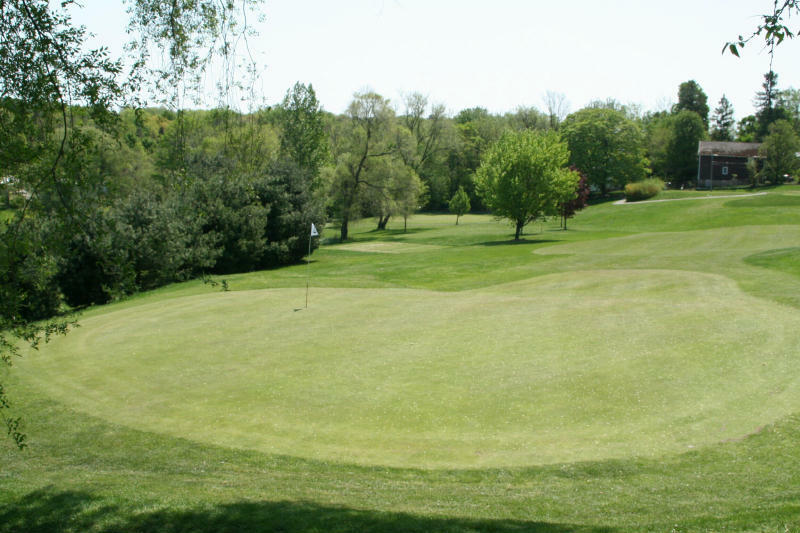 A drive of 200 yards or more will leave the player safely in the fairway and over Creegan's Creek on this 311 yard par 4. An uphill wedge or a short iron should be all you'll need to attack this green protected by bunkers left and right.